I was musing on the value of learning bird topography this morning, wondering why it is so important to know the greater coverts and supercilium and all the rest. The easy answer is that it gives us a framework to describe the color patterns of birds, but I think there’s even more to it than that. 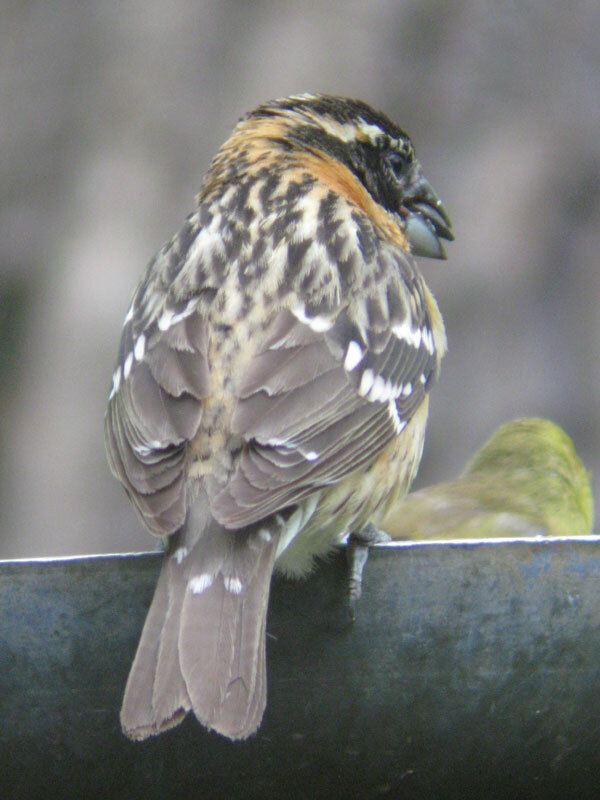 Black-headed Grosbeak - a "field-guide-style" profile view. Find the scapulars, the supercilium, or any other group of feathers you like, and compare their appearance here with the two photos below. Notice how the shape and angle of the feather groups seems to change as our view of the bird changes. This information can be applied to any species of bird, and helps to understand the changing appearance. Photograph copyright David Sibley, June 2009, Pine Butte Guest Ranch, Montana. 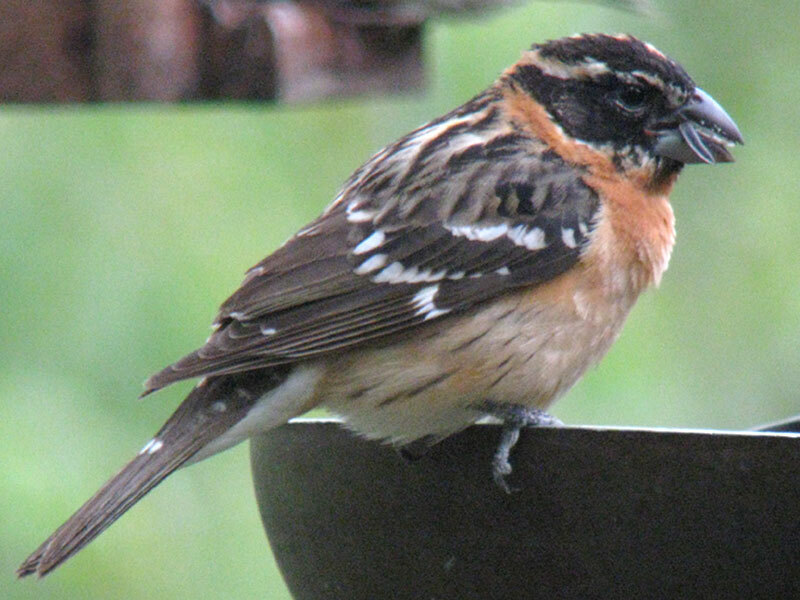 When we study a field guide we can memorize the color patterns in standard profile illustrations, but birds are 3-dimensional and they move around. It wouldn’t be practical to memorize hundreds of different “patterns” specific to different angles, and that’s not how our visual perception works. We memorize one pattern and apply basic rules of perspective to adapt to different viewing angles. 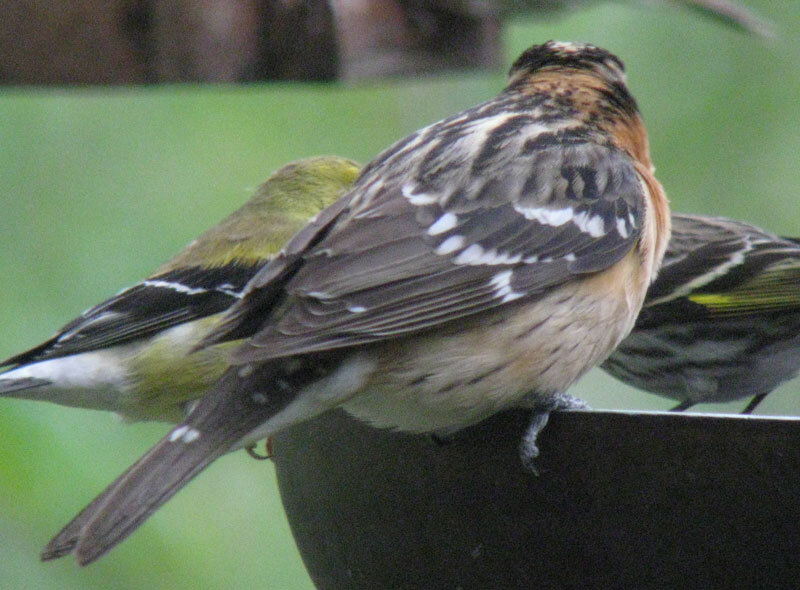 One of the keys to successful bird identification in the field is being able to translate the two-dimensional pattern we know from the field guide, and apply it to a three-dimensional bird that keeps showing us different angles. Our general experience with visual perception has taught us rules of perspective that allow us to account for changes in appearance, but that has to be informed by simple things like knowing the planes of the surfaces of a birds body. The wings fold up on the sides of the body, the supercilium is mostly on the side of the head, crown stripes on top, etc. Anyone who watches birds a lot will learn this, but learning bird topography will help explain it. It’s very helpful to know what parts of the bird will be visible from any angle, what plane they are in, and the arrangement of feathers that form those parts. That will allow you to apply perspective and anticipate the color pattern. Bird topography provides a framework for describing color pattern, and also provides a framework for understanding structure and perspective.